Red Nose Day, the U.K.’s #1 television fundraising event, is coming to America in a spectacular star-studded special live on Thursday, May 21 (8-11 p.m. ET) on NBC. Inspired and supported by Comic Relief U.K. – the British charity behind Red Nose Day – NBC will televise the three-hour benefit featuring hilarious stand-up comedy, clever parodies, sketch comedy, incredible music performances from A-list artists and short, compelling films about the cause. Funny or Die, the award-winning top destination for comedy on the web and producer of high-quality content across numerous platforms, will partner with NBC to create original content for the special. In the U.K., Red Nose Day has been going for 30 years and is an inspiring cultural phenomenon that unites people from all walks of life in the interest of saving and changing lives across the globe. With superstar presenters and comedians, original sketch comedy, hilarious film parodies and amazing musical performances, Red Nose Day has been the one of the BBC’s highest-rated Friday night shows for many years, and it has raised more than $1 billion in donations so far for organizations addressing poverty. 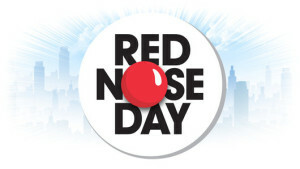 Created in 1985 by Oscar nominee and Emmy Award-winning writer-director-producer Richard Curtis (“Four Weddings and a Funeral,” “Bridget Jones Diary,” “Notting Hill”), the idea of Red Nose Day was built upon the foundation that mass media and celebrities can help raise money and awareness of poverty to save and change millions of lives. Richard Curtis will serve as an executive producer for the NBC telecast (a Universal Television production), along with Hamish Hamilton and Ian Stewart of Done + Dusted Productions. Henrietta Conrad and Lily Sobhani will also serve as executive producers, as will Mike Farah, Anna Wenger and Joe Farrell from Funny or Die. Hamilton is set to direct. David Paley, Talent Executive, Hilary Gladstein, Line Producer and Billy Amato, Logistics Specialist for Bermuda Limousine International.